Anyone with a cursory familiarity with the internet will recognise the archetypal meme instantly: an image that can be humorous, but isn’t always, and that’s overlaid with header and/or footer text. It might be an image of cats, dog(e)s, frogs, or other animals; celebrities or pop culture scenes; hi def or lo brow photo-shopped or MS Paint graphics that are real, drawn, or computer generated; white Impact font in ALLCAPS or primary-colour clouds of Comic Sans text; or, at the limit of what we might consider an image, the looped movement of the GIF. This content is more or less schlocky and popular. In broader terms, the word has been extended to other forms of digital media, including easily re-shared (often inspirational) phrases; short videos, like vines; or even embeddable audio clips and sound-boards. The meme has sloughed off its neo-Darwinist associations and is now taken to be internet culture’s minimal, circulating unit. The meme is not just an image, but it is usually consumed, produced, disseminated and manipulated through graphic user interfaces and distributed platforms. The interface is the non-visual meme’s visual frame. Perhaps, like Hito Steyerl’s “poor images”, the meme moves like an “errant idea” (Steyerl, 2012: 32), tracing the path of that which goes astray. Steyerl also says of the poor image that, “[i]n short: it is about reality” (44). The meme is internet schlock, but its errant movements also expose us to the massively distributed networks that are less a virtuality than an other elemental milieu. 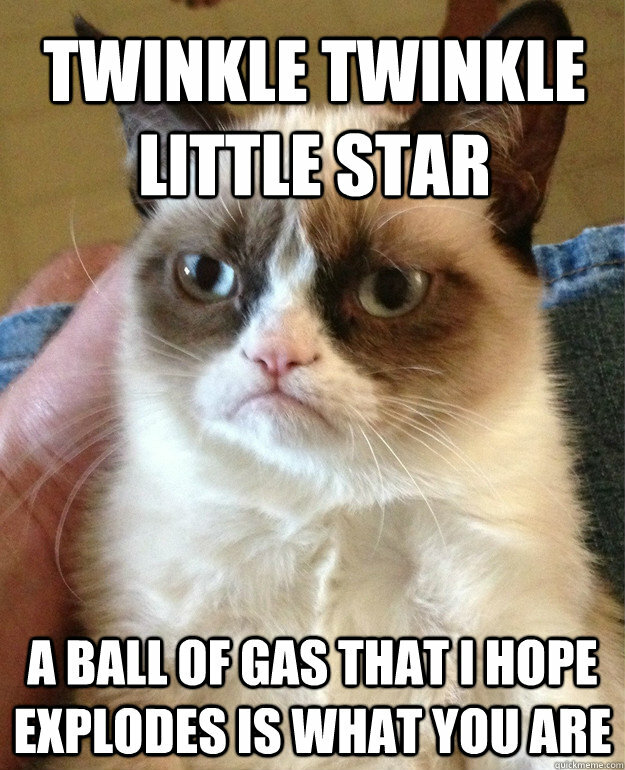 Like the more strictly defined internet images that Maria Olson describes, memes “circulate in excess” (Olson, 2008: 280). This excess, the internet’s, is what the meme indexes. Not only because it exploits network infrastructure to make internet culture move, but because the meme is, in a very basic way, in excess of itself. The meme is always more than a particular instance because it has a double character. To function as a meme, media must express an organising syntax. The meme-instance is also, always, a member of a meme-series. But this quality makes it this almost-contradictory excessive unit hard to theorise. The meme resists reduction to its putative “content”, troubling typical – discrete, additive – understandings of cultural objects. A definition of the meme like the one Limor Shifman offers is indicative. Shifman’s definition identifies three main characteristics: it encapsulates “a group of digital items sharing common characteristics of content, form, and/or stance”; it states that these items “were created with awareness of each other”; and it stipulates that these items “were circulated, imitated, and/or transformed via the internet by many users”(Shifman, 2013: 41). Or: the meme is serial; produced collectively; and it circulates. Whilst Shifman’s definition is useful, it is also limited. 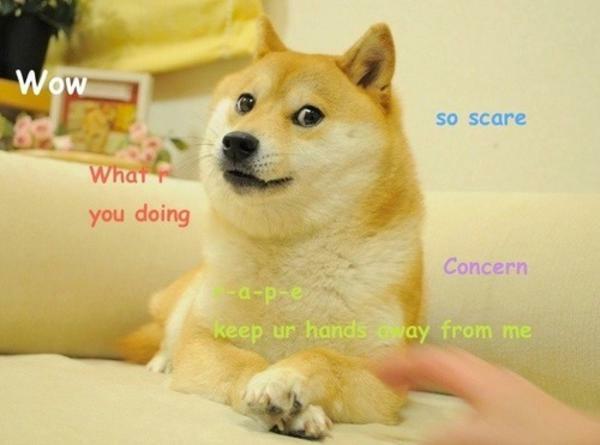 Take the Doge meme, one of the most popular (Anglophone) memes of the past few years. The popular Know Your Meme (KYM) platform, a user-generated meme encyclopaedia, constructs a taxonomy of the Doge meme by identifying its common characteristics. These include the ur-content of the now-iconic Shiba Inus breed of dog and the Comic Sans MS font overlay in basic, bright colours; the twisted misuse of the formal grammatical modifiers, much, many, so, very and such (as in typical phrases like “very Doge, much cool”); and the related ironic “contemplative” stance that, it is argued, these features engender. KYM historicises these features by relating them to key platforms, like the “Shiba Confessions” Tumblr, or media, like the seminal clip from the early comic web series, Homestar Runner, that is credited for spelling out and so initiating writing/saying D-O-G-E.
How are we to use these materials to understand what a meme might be? Taken alongside Shifman’s framework, the data that KYM archives can be stitched into a history by enumerating instances and bringing them in to a more or less adequate genealogy. The second-person plural past tense Shifman uses – memes “were” created, “were” shared – defines the meme as a nominalistic collection of instances with a trackable provenance. This approach allows us to understand the meme as an accretion of instances that merge, like tributaries, into its contemporary instantiation. But this reduction to the collection of instances elides the meme’s collective, excessive character, because the “group” it describes is not the same as the “series”. This approach fails to escape a basic theoretical aporia confronting any theory of the meme: that “Doge” designates both a Doge, an instance, and the Doge, the series. The series can neither be reduced to nor transcend the collection of instances that comprises it. Or: it is in excess of its apprehensible content. This claim can be clarified by Georges Bataille’s distinction between a “restrictive” and a “general” economy. In Shifman’s model, making memes is the prerogative of participatory users and amounts to a kind of collective activity. It presents what Bataille calls a “conventional set of human activities”, or a restricted, enumeratable group (Bataille, 1988: 68). In the face of this model we might ask, what’s the return on a meme? Can the meme be limited to the sum of its constituents, or does the meme put something more into play? 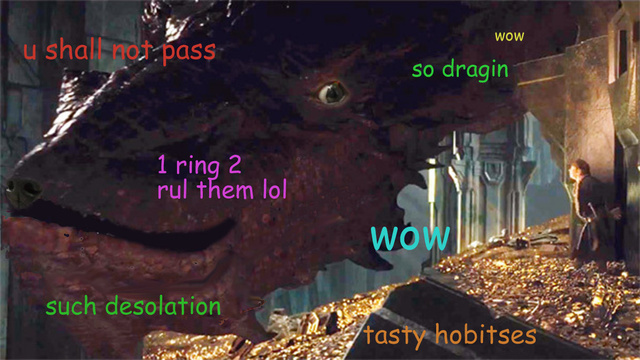 How does a meme, like the Smaug meme below, emerge out of, mutate, or deconstruct the Doge? The tendency to reduce the meme-series to its content is symptomatic of a broader problem in media studies. A meme is only a meme, or a meme-series, when it enters circulation. Yet media studies so often fails to account for what the mechanism that underpins distributed cultural production, the circulation of media, actually is. When the meme ceases to circulate, it ceases to exist. The “irreducible movement” that Bataille ascribes to his “general economy” (68) is integral to both its mediation and its basic continuation. To understand why the meme is in excess of its content, we need to ask what it means for a meme to return. Circulation could be described as fundamental to large-scale media, but it’s not very well theorised in media studies. Our usual understanding of circulation is problematic, because it’s tautological. The etymology of circulation, which denotes or has denoted something spreading or moving through something else, is inscribed with its own media theory. Circulation is usually understood as the circulation of content through a medium. Sianne Ngai, for instance, defines circulation as “the technologically-mediated movement and dissemination” of things like “information, discourse and commodities” (Ngai, 2012: f.n.1, p. 246). For memetic media to be reduced to content, then, they need a carrier: the networks that content passes through. But this division between content and network, or matter and form, generates a problem. The problem plays out like this. When we ask the question, “what is circulated”, we get the following answer: content. But if we follow this question with another, “what is circulation?”, we get a tautological answer: circulation is the circulation of content. If content is already understood as, by its very nature, having already been put in circulation by its technological substrate, the circular nature of our conception of circulation becomes clear. Content circulates; technology circulates content. The concept of the circulation of content is without content. “Content” is the death mask of circulation. 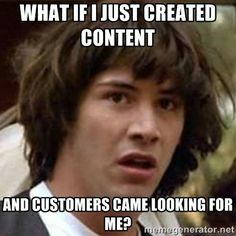 Content is content because content is content, which is to say because it isn’t anything in particular. If the meme is analogous to content, it has no utility as a concept. It would signify a contradictory impulse: to understand the meme as a unit that is both informational, and so seemingly free to circulate; but also phenomenal, and so understood through and for us. The impulse to reduce the meme to its instances does violence to the concept because it assumes that the meme’s singular, phenomenal form is primary. It elides the meme’s irreducible, nonhuman movement because it assumes that the economy of the meme produces returns that can be cashed in by an aggregate of human actors. That’s probably not realistic, Keanu. We can apprehend this movement’s velocity when we ask, instead, what it means for a meme to return. Karl Marx’s concept of circulation helps us to frame this question. Marx argues that the circulation of capital must be “grasped as a movement, and not as a static thing” (Marx, 1993: 185). Capital’s movements intersect with, but are not equivalent to, internet culture’s. But, we can nevertheless begin by focusing on circulation understood in excess of its infrastructural carriers. Circulation is the process through which something returns – but not necessarily to us. Circulation forms a circle, “autonomising” a process that is abstracted from its contents (Marx, 185). Sheared from the dynamics of capitalist value creation, this process – Verselbstständigung, achieving an independent existence – autonomises the meme as a processual series. The meme that enters circulation returns to itself. If the meme is neither content nor instance, what kind of media is it? The concept itself exceeds the mere image, encapsulating GIFs, vines, bits of text and short audio clips. Memetic mediation is irreducible to the instance, but it shouldn’t be confused with its network infrastructure. The meme in excess of itself reorders what we think of as media, because its mode of mediation exploits the processual, constantly mutating distribution of the network itself – and makes it available for manipulation. Sybille Krämer argues that “”mediation” must be understood as radically extrinsic, as the back-and-forth of circulation itself” (Krämer, 2015: 54). What we would otherwise call the meme’s “content”, its intrinsic qualities, are secondary to its extrinsic quality, that it has entered circulation. The instance or its content is a retroactive epiphenomenon of the process of the meme returning to itself. Steyerl says of the poor image that it “is no longer about the real thing – the originary original” (Steyerl, 2012: 44). The Doge’s genealogy is secondary. What it’s about are “its own real conditions of existence:  swarm circulation, digital dispersion, fractured and flexible temporalities” (44). To return to what I said she said before, “in short: it is about reality” (44). The Doge meme has also morphed into a Cyrptocurrency with a real world value, mixing alternate modes of circulation – and the modes of reality they produce. The meme is a kind of media, only not the kind we’re used to dealing with. Bernhard Siegert has critiqued media studies’ tendency to reduce media to usually screen-based devices and interfaces (Siegert, 2015: 87) – to that which is discrete. But the meme’s circulation mediates, and can be used to manipulate, a specific relationship to reality. The meme can only return to itself, or exceed itself, because it can collect a certain kind of return made possible by another kind of abstraction. What we call the internet is not an internet, but a series of networks governed by protocols, technologies and distance (Dourish, 2015). These networks trace a very terrestrial material infrastructure: the letters labelling Google’s search interface transmitted to us, along fibre-optic cable routes first laid for telegraphic communication (Easterling, 2014), from massively-polluting data centres whose cooling pipes echo this logo’s hues. The internet is not an abstraction or a frictionless space through which data flows, because we can point to where it quite literally is. But circulation nevertheless generates a kind of abstraction that subsists in the joints of its massive, global distribution. Benjamin Bratton’s fiction of “the black stack”, which describes this global distribution, has a certain kind of utility for thinking memetic mediation. Global data movements might not flow freely – or at all (Sutherland, 2013) – but they are in excess of our ability to either comprehend or to calculate them meaningfully. As John Durham Peters quips, “ontology, whatever else it is, is usually just forgotten infrastructure” (Peters, 2015: 35). The internet is not reducible to a re-presenting network map. Rather, this kind of mapping is a “cultural technique” that, given Siegert’s argument that ontology emerges out of “concrete ontic operations” (Siegert, 2015: 87; 2013), provides us with one way of dividing and mediating the internet’s distribution. 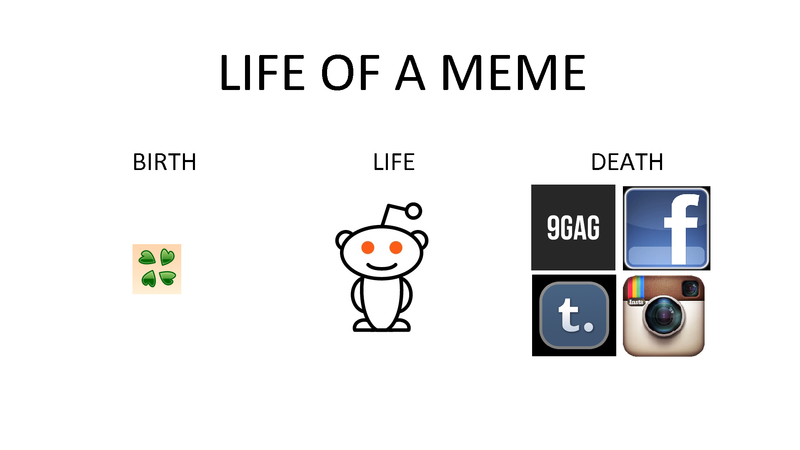 The production and circulation of memes is another kind of technique. If the meme has any utility as a concept that is non-medium-specific, it is because it emerges from a cultural technique that is specific to a massively distributed network real: the meme that returns, in excess of itself, is first made as a kind of offering. The fiction of the stack or of massive distribution has a limited kind of phenomenological truth: the internet is in excess of us. The eventual heat-death of our solar system undoes any empirical efficacy that Bataille’s concept of a “solar economy” might have had as energetic apeiron. But his idea of squander is still useful for thinking the excessive dynamics of memetic circulation. Making memes is a kind of expiation, a kind of offering made to what we construe as excess itself. Any return that we might get from this meme is secondary to the originary return it must first make to itself. Memes aren’t for us, but they participate in what Alexander R. Galloway calls the “furious” network real (Galloway, 2013). 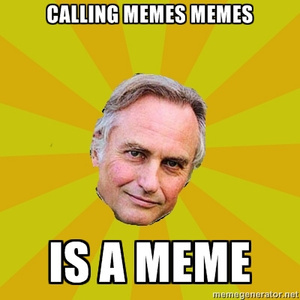 Memes are non-media-specific because the basic technique that presupposes them is the mediatic mode of making an offering to the network. This is, in the end, why the meme’s content is epiphenomenal. The “content” of the meme, or what we consume, is retroactively condensed as a set of associated, and, contingent techniques: the Shiba Inu, Comic Sans, etcetera. It’s real “content” that we consume is not, originally, what the meme contains, but that it is able to circulate. This expiatory technique is processual and recursive: we – where this term is understood, always, in terms that are singular and collective (see Stiegler, 2009) – try to manipulate the abstract reality of massive distribution by making memes. Olson has described internet images as “the vertebrae of a body that we otherwise seek to theorise as amorphous” (Olson, 2008: 281). Memetic mediation gives the network a furious, mutating, threatening spine. But if this expiatory technique traces a mode of existence, it is one in which what is shared is only shared indirectly and may never return to us, as either profit or as experience. By exploiting the furious reality of distributed networks, this technique traces the outlines of alien processes that we can only ever access obliquely. The mode of existence of technical beings (see, i.e., Simondon 1980) introduces scale into experience. What is huge may be entirely indifferent to what isn’t. Though our sun radiates huge amounts of energy, it will one day die. We rely on it, but it is radically indifferent to us. Or: we may make our offerings to the internet, but the internet will remain unknowable in its entirety. Contra Bruno Latour, networks are not necessarily available at all of their points. This is an abstraction, but it’s also real. The relationship between the act of expiation and subjectivity is oblique at best. Its effect on us is less like the sun’s excessive rays and more like an enveloping atmosphere, a milieu that can only partially be perceived (Peters, 2015: 46). What does it mean for experience if the act of giving to an abstraction is not only not reciprocated, but that the non-reciprocity of what is massively larger than us can be exploited as a technique? The meme errs because it doesn’t rely on us. The furious “non-human” swarms. Bataille, Georges. The Accursed Share: An Essay on General Economy. New York: Zones Books, 1988. Dourish, Paul. “Protocols, Packets and Proximity: The Materiality of Internet Routing. In Signal Traffic: Critical Studies of Infrastructure, eds. Lisa Parks and Nicole Starosielski. Urbana: University of Illinois Press, 2015. Galloway. “Love of the Middle”, in Galloway, Thacker and Wark, eds. Excommunication: Three Inquiries into Media and Mediation. Chicago: Chicago University Press, 2014. 25-75. Krämer, Sybille. Medium, Messenger, Transmission: An Approach to Media Philosophy. Trans. Anthony Enns. Amsterdam: Amsterdam University Press, 2015. Marx, Karl. Capital Vol 2: A Critique of Political Economy. Trans. David Fernbach. London: Penguin, 1993. Ngai, Sianne. Our Aesthetic Categories: Zany, Cute, Interesting. Harvard: Harvard University Press, 2012. Peters, John Durham. The Marvellous Clouds: Toward a Philosophy of Elemental Media. Chicago: Chicago University Press, 2015. Shifman, Limor. Memes in Digital Culture. Mass. : MIT Press, 2013. Siegert, Bernhard. “Cultural Techniques: Or the End of the Intellectual Postwar Era in Germany”. Online: Theory, Culture & Society, 2013. 1-18. — “Media After Media”. In Media After Kittler, eds. Ileni Ikoniadou and Scott Wilson. London: Rowman & Littlefield, 2014. Stiegler, Bernard. Acting out. Trans. David Barrison, Daniel Ross and Patrick Crogan. Stanford: Stanford University Press, 2009. Steyerl, Hito. “In Defense of the Poor Image”. In The Wretched of the Screen. Berlin: Steinberg Press, 2012. 31-44. I seek to undertake a detailed analysis of the historical perspective of Digital Humanities in a technology oriented media age, and would like to investigate how digitised records (consisting of visual or a textual data) and interfaces defined by algorithmic systems within computational machineries was transformed by informatics within interfaces. As well as the theoretical perspective, my research will continue to deal with the case studies theorising within a media archaeological perspective including the concepts of materiality, medium and dynamics of interfaces in keeping up with the hybridity of digital humanities. It is largely recognised that the frameworks of a system in media-historical principles are based on the perspective of the archivological approach in the sense of Digital Humanities. A media archaeological approach, in an advanced notion of storing data, refers to the idea that historical objects are not possibly constructed by only the media itself. The context of the various media systems from Library catalogs to microfilming have been affected as well as the notions of the historical remains of the archive itself. (Ernst 2013) The traditional understanding of storing data is based on the idea of classifications of inventories. This, however, is replaced by a fluctuating order of information by dynamic access. Thus, it is observed in scholarly research that the archive is redefined by the transformation from being passive storage to an alghoritmically-generated process. (Ernst 2013) In this regard, this article analyses this dynamic transition among data, archive and the digital medium, examining their connections by inspecting interfaces through theorising the historical approach from a critical perspective. In accordance with the hybridity of the digital humanities, the surrounding research for the article draws on the realms of history and media archaeologies crossing interdisciplinary studies to develop a broader theoretical analysis. The main subjects of the article provides the research questions by giving a brief summary by answering the questions: (1) What is the main reason(s) of the transformation of traditional Humanities and how is Digital Humanities reconceptualised regarding its metamorphosis analysing its context and theory? (2) How and what ways can Digital Humanities be investigated regarding the historical perspective of interfaces? (3) What is the relationship between the narrative and the object as a medium through a close attention to the case studies in a comparative basis in terms of materiality, and how, regarding the case studies, are interfaces and computational archaeologies influenced by the operations of cyber culture? The centrality of the archivology draws a study around cultural and media archaeology through a Foucaultian concept from the physical concreteness to abstract discourses in terms of storage. In a regular sense, the archive is supposed to be a mileux for storage, preservation, classification and access. (Rossaak 2010b:11; Parikka 2012) In other words, it can be seen that the archive is considered as an abstract concept of storing data of modern culture, which operated as a medium itself. (Parikka 2012) In this regard, the article centralising the studies of multiple disciplines of history and media, hybridised with the theoretical research based on solidification of “intangible cultural heritage” (Laszlo 98; Flanders, Piez and Terras 2007) that aims to demonstrate a critical analysis depending on case studies. David Bolter and Richard Grusin’s work Remediation (1999) demonstrates the fact that media itself expresses a constant change within a repeated movement of resemblance offering a simultaneous form of mediation through the scope of medium specified analysis (MSA). It depicts an alteration in the language of media communications such as text mediating into a digital medium as a vocabulary of screen and page processing in a digital software and analogue interface with the hybridity of code and ink, controllable buttons and images in an algorithmic system. (Hayles 2004) In this regard, a distinctive infrastructure between ‘old’ and ‘new’ media was offered by Manovich to be able to conduct MSA; which are (1) numerical representation; (2) modularity; (3) automation; (4) variability; and (5) transcoding. Emphasizing Hayles’ ideas on transcoding, it is seen that “numerical representation” is considered as the most viable matter in terms of its dynamics and programmability at medium’s specificity. To be able to investigate these dynamic interactions, Medium-Spesific Analysis (MSA is seen necessary. It constructs an electrifying neocortex of literary criticism into recognising which strands on a traditional emphasis on materiality which are examined paradigmatically emphasising on the literary effects emerging the materiality of the texts that refers to the hypertext commonly used in both digital and print media. In alignment with the auraic potential of the material outlined by Walter Benjamin discusses the unique existence of the physical object regarding the time and space, and it is claimed that the originality vanishes in reproductions since it tarnishes the ritual of the object through the process of digitisation. In this regard, it is claimed that the originality of physical objects loses its authenticity. In his work “The Work of Art in the Age of Mechanical Reproduction”, Benjamin claims that the metarial objects have a one-time experience in terms of their uniqueness. According to him, the aura represents for this experience of unique value which stresses on the fact that objects cannot be multiplied or reproduced. Another similar argument that he proposes is the “aesthetic experience” of the aforementioned one-time experience. An aura can be applied to the original piece of work. Replicas of the objects ruin the authentic aura of the unique experience. In this regard, centralising Benjaminian arguments, the article draws a critical approach of both of the case studies in terms of archivological sense. Archival objects which represent a cultural value in the scope of Digital Humanities, are metaphorically divorced from physicality and transforms into a distinctive form of material as they are stored in computational algorithms that are connected to a protocol. In this regard, this chapter will include a detailed historical aspect of the digital humanities analysing the metamorphosis of the medium by the “computational turn” (Berry 2011), and how digital humanities is mediated through computational surfaces. This chapter aims to analyse the component arguments connected to its humanistic attitude of the transformation by regarding the genealogical sense of digital humanities focusing on textual medium offering concrete examples in relation to interfaces through the lens of narrative theory, networks and aesthetics in an historical sense. Unlike many other interdisciplinary experiments, humanities computing has a very well known beginning. In 1949, an Italian Jesuit Priest, Father Roberto Busa, began what even to this day is a monumental task: to make an index verborum of all the words in the works of St. Thomas Aquinas and related authors, totalling some 11 million words of medieval Latin. This article has far intended to investigate the concentration of theories connecting to database, software, interface and materiality applying the case studies by the analysing of distinctive concepts. In this regard, in accordance with media archaeologies of digital humanities, my respective work represents an exploration in interface analysis of the medium through the scope of archivic objects migrating from a concrete medium to a digital mileux regarding the concept of intangible cultural heritage and materiality of the archive. Along with the aforementioned methodologies and literatures, the transformation of material and the medium was pertained by the most frequently question among digital humanities scholars and historians; “what happens to the archivological material once it is replicated and deported through a distinctive medium?” To borrow Hayles’ words; “as inhabitants of globally interconnected networks, we are joined in a dynamic co-evolutionary spiral with intelligent machines” (2006) referring to the inevitability of machinerised technologies which employs dynamic activities in terms of the association with human as a subject and information technologies. A computer contains not only hardware but also a digital medium with texts and images as a representation on its screen. As such, interfaces are making an interpretation of the computational procedures into mitigating, well-known or “user-friendly” visuals and metaphors as known from much software, along these lines masking the computer as something surely understood. Through this frequent notion of the interface (as a surface), computational processes and the way we co-exist with computational processes are critiqued, and it is asserted that the understanding of interfaces requires to be subjected. As Dragana Antic and Matthew Fuller argue in “The Computation of Space”, it is indicated that the interchangeable dynamics of computer-interface connectivity regard the space and production of medium. As it is observed that the interface turns into a co-extensive medium concerning its reflectivity on computation through spatial design and experience within a genealogical approach. Parikka, J. What is Media Archaeology? Cambridge, UK: Polity Press. Tambling, J. and Hayles, N. How We Became Posthuman: Virtual Bodies in Cybernetics, Literature and Informatics. The Modern Language Review, 96(1), p.143. “I Like What I See” is a Chrome extension created by the artist Steve Klise. When activated this experimenting piece of software will click the Like bottom on every post you encounter, while scrolling down your newsfeed. Consequently, this means that you do not have to neither Like nor like anything, the “I Like What I See” application will, literally, Like what you see for you. Klise’s experiment is obviously a response to the paradoxical numbness in liking, which arguably is installed in and intensified by the Facebook like-economy; within this social site it is extremely easy to express approving emotions detached from any truly embodied affect. In fact, it only takes a click. However, Klise’s project is also shedding light on other relevant troubling aspect encompassed in the realm of interface culture, which became evident when Mat Honan through his Facebook profile liked everything he saw manually; this liking-everything-activity not only blurs the profiled user’s true interests, but, as Honan reported, it also explodes the newsfeed with strange, irrelevant and – for the greater part – commercial content (Honan). How does this pollution of irrelevance happen? Because inherent in Facebook we find the newsfeed algorithm called Edgerank, which monitors and analyses a user’s Like, shares and comments. This in order to show the user, what he or she is most likely to be interested in – maybe especially provide the user with ads for products, he or she is most likely to buy. Thus, if everything is Liked, the algorithm will push everything in the user’s direction. The fact that our activity online is monitored by algorithms and therefore available for analysing and tracking, is the condition we accept as users of social media sites. The premise is, as is the point of Tiziana Terranova as well Bernard Stiegler, that the asymmetrical, passive/active relationship in communicative situations between human beings (like/being liked for instance) has become objects of grammatizations; discrete, written data-entities within online forums. This means that buttons constituting our social and interactive behaviour online are “linked to underlying data structures (…) and subjected to the power of ranking algorithms”. (Terranova 394). Consequently, due to an underlying code, Like, Share, Go, Tweet, Accept, buy etc. are indexically referring back to the clicking user. With the point of departure that monitoring and analyzing algorithms are part of our everyday communication practice, I am in the course of this paper going to investigate subjectivity in language when the subject is constituted in language plus an underlying computer code. As is the case of Facebook, when we click Like and socially express approval and at the same time are indexed and analyzed accordingly. In other words, how can we approach subjectivity in language, when we speak in language plus an underlying code, which operates simultaneously with the enunciating practice on the interface of the user? As “I Like What I See” illustrates, even innocent Likes can cause an excessive online existence, since our information is perpetually available for algorithms owned by advertising agencies, when the click links to invisible data structures. In order to discuss subjectivity in language, I draw on the linguist Émile Benveniste and his theory of enunciation. In his line of thinking, the unique person, the subject, is constituted within language in use – or language in discourse – and only here. In other words, it is in exercising language, we can articulate ourselves as ourselves; it is in exercising language we are able to say “I”. Thus subjectivity happens in language, when the enunciating speaker is setting himself up as such – pronouncing himself the speaker in terms of appropriating I. Every time the I is employed by a speaker, the present time of the utterance and, inevitably, the presence of the speaker is introduced as well (”Le Langage et L’Expérience Humaine” 67-68). And this is how the “present” moment becomes eternal. The moment of the utterance cannot escape its own presence. The present time is always inherent in the discourse and, thus, always inherent in the constitution of subjectivity. An utterance is never repeated, it is enunciated again, every time employing this present moment, every time producing a new subject, every time a new I, here and now. To sum up, according to Benveniste, language as system holds voids in the shape of pronouns, and subjectivity is constituted when a speaking subject enters language, fills up the void and designates itself as the speaker in a present time discourse. I is the person uttering within the present discourse containing I, or, in other words, the subject is the I speaking here and now. So how is this relatable to the constitution of subjectivity online? Where is the empty signifier I, which can be filled by a human subject in language plus code? Why is it relevant in relation to compulsive Liking, which subjects us to the power of algorithms? Christian Ulrik Andersen argues that the linguistics voids in a computer interface equates the buttons connecting the user with a given function (Andersen 208). Following this point, the buttons we manoeuvre with the mouse or the keyboard of the computer can be said to equate the empty signifier I as they offer themselves to be appropriated by a speaking subject. However, in the matter of subjectivity, it would be problematic and imprecise to make a complete parallelization between buttons and the linguistic I, since the computer interface already functions within the symbolic realm of language. The empty signifier I in computing seems to be several different buttons, all of them, very literally, offering themselves to be clicked by referring to their individual function in a particular situation either symbolically (i.e. search) or iconic (i.e. thumbs-up). Opposing the empty character of the personal pronoun by already entailing a referent, which is fixed in a given function, it is evident that buttons in computing are already filled and thus hold value before the instance in which they are used. Nevertheless, for this study, like several scholars before me (Friedrich Kittler, Alexander Galloway, N. Katherine Hayles, Florian Cramer, Wendy Chun etc.) I perceive code as a sign system, a structure similar, or even parallel, to language; a sign system in which we speak and communicate (emails, status updates, comments, search queries etc.) and therefore a system, which can be actualized or realized on a semantic level. I would then argue that computational media holds the quality of being conditioned by a discrete data structure, which enables activation of language in two semantic layers, with two different semantic values of meaning; a “conscious” layer in natural language (the interface of the user) and what I will call a sub-semantic layer in the underlying code. Following this, these parallel semantic layers must also allow for two different referents, each employing and producing meaning in their respective system. This then qualifies the postulate that the interface button – being natural language plus an underlying code – can be filled in natural language and at the same time be an empty, available signifier employed in code as a language system. Accordingly, the interface button, as for instance Like, has two referential organizations in its click-ability: the filled, fixed Like of natural language, and the empty, available I, unique in its use each time, depending on the individual click. In other words in the instance of clicking Search, Share, Like, Post, Tweet as well as Buy and Accept you are also saying I. Hence, the click is the act of enunciation, the act of transforming an empty available signifier in code as a language system into a unique designation of a speaker – just as saying I transforms the system of language into discourse. To crystalize the point here, the click automatically prompts the coupling of natural language and computer language, since it is in the click and only here this extra language is “spoken”, converted into discourse, into use, by a speaking subject. Basically, this means that even when typing 140 characters into my Twitter-profile without pressing tweet, or creating a status update on Facebook without clicking post, while this designates me as subject of the given enunciation in natural language, it will not be an enunciation within language plus code. The code as language has not yet been actualized in the click, and so the enunciation remains on the level of natural language. With click the subject couples the two systems and is, thus, produced within both. Furthermore, in Benveniste’s theory of enunciation it is important to clarify that subjectivity is a property of language – that is to say, subjectivity takes place only insofar as a person speaks. The subject exists solely within its own utterance, in the immediate act of the enunciation. Inevitably, as a consequence, the subject does not exist before or after the instance of discourse in which it is speaking. Following this, given that the subject is constituted in the appropriation of the I, then the click in this analysis must include a double subjectivation of the speaking subject online. Accordingly, the subject is constituted within and produced through not only language, but is in fact a property of language plus code, when the click as an empty signifier is appropriated by an (already) speaking subject. What “I Like what I see” demonstrates is the fact that I with my Like also Like what I do not see. And what I do not see is underlying data structures such as news feed algorithms. Consequently, I become a subject of the algorithms flooding my Facebook with customized offers; algorithms producing me in not only language as a system, but also in systems mirroring my predicted consuming, political etc. intentions. Click produces an excessive me. Andersen, Christian Ulrik: Det Æstetiske Interface, Digital Aesthetics Research Center, Aarhus: 2009 (print). Benveniste, Émile: ”Le Langage et L’Expérience Humaine”  in Problèmes de Lingustique Générale II, Paris: Édition Gallimard, 1974 (print). Benveniste, Émile: “The Nature of the Pronouns” [La Nature des Pronoms, 1956] translated by Mary Elisabeth Meek in Problems in General Linguistics, Miami: University of Miami Press, 1971 (print). Benveniste, Émile: ”Subjectivity in Language” [De La Subjectivité Dans La Langage, 1958] translated by Mary Elisabeth Meek in Problems in General Linguistics, Miami: University of Miami Press, 1971 (print). Honan, Mat: I LIKED EVERYTHING I SAW ON FACEBOOK FOR TWO DAYS. HERE’S WHAT IT DID TO ME, Wired, 08.11.14. Unlike Us Reader, Institute of Network Cultures, Amsterdam: 2013 (print). Terranova, Tiziana: “Red Stack Attack!” in Avanessian Armen & Mackay, Robin #ACCELERATE, pp. 379-399, Falmouth: Urbanomic, 2014 (print).